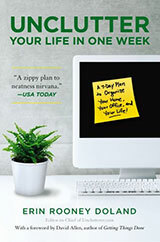 We know that many people have chosen “getting organized” as a New Year’s resolution – and some of those people want to get started now! Here is a short-list of Unclutterer posts that can help you get a jump-start. Happy New Year from the Unclutterer Team and all the best to you in your organizing efforts. Many people make New Year’s resolutions related to uncluttering, organizing and managing their time — and you may be among them. The following tips might help you stick to your resolutions this year. 1. You don’t have to begin on January 1. January 1 might be a difficult time to start, coming right after the hectic holiday season. But you can choose to start at a different time, such as Epiphany (Jan. 6) or Groundhog Day (Feb. 2). Or maybe you’d like to start resolutions on your birthday. There’s no one right time, so choose whatever seems best for you. 2. If you tried something last year and it didn’t work, try something a bit different this year. You may have resolved to get organized in the past, perhaps using books as guidance, and not achieved the results you wanted. If you tried doing it all alone, maybe it would help to include someone else to cheer you on, provide advice, etc. The Unclutterer Forum is our online discussion section where fellow unclutterers post their challenges and successes as well as tips, tricks, and tools that they use to stay organized. Many people like FlyLady, with her free daily emails (while others think it’s too much). There’s now an iOS app, too. The Apartment Therapy website runs a free group project called January Cure with “one-manageable-step-at-a-time assignments” which are “designed to help you create a cleaner, more organized and peaceful home.” You can sign up now for the emails. You could work with a friend who has a similar goal. But be sure to pick a friend who will provide the encouragement you need, not one who will push you to make choices that make you uncomfortable. If you’re willing to spend a bit of money, Clutter Diet memberships give you access to videos and tutorials as well as access to virtual consulting services from a team of professional organizers. If finances allow, you can hire a professional organizer to work with you in your home, either to jump-start your organizing efforts or to work with you until you’ve accomplished your goals. 3. Consider how you might incorporate helping others into your resolutions. It would be nice if at least one of the actions we contemplate doing in the new year was helping to better someone else’s life. Uncluttering can lead to donations of still-good items to local charities (social services agencies, charity-run thrift stores, or even neighbors in need via freecycle or Nextdoor). More thoughtful buying leads to less clutter — but it may also allow you to donate, to the good cause of your choice, some of the money you are no longer spending. Better time management may free up some time to volunteer for one of the many organizations that could use your help. Maybe that component will give you extra motivation to stick with your resolutions! Perhaps it’s from parenting young children, but when I go into the bathroom, I appreciate the peace and quiet – and the privacy. Now, lo and behold, with the Talking Toilet Paper Spindle, the toilet paper will talk to me. I can’t think of another thing that would be so disturbing as someone leaving me a message via the toilet roll. 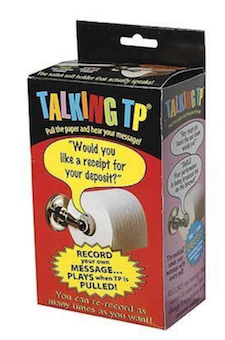 This talking toilet paper spindle allows you to record a 9-second message that will play when the user pulls the toilet paper. Then the user can record a rebuttal right after. As if texting in the bathroom wasn’t bad enough, now you can have a verbal conversation via the toilet paper. I could expect something like this if I was visiting a fraternity or a joke shop but I couldn’t imagine having this in my home. Happy holidays! Everyone at Unclutterer hopes you’re enjoying some time off work, to relax and enjoy the company of family and friends – and for many of you, helping them figure out how to use a new gadget. Nothing says “holiday” like family tech support. With a little planning and organization, it can be a pleasure to help family members and friends enjoy their new electronic devices or answer questions they’ve compiled since the last get together. Here’s how to prepare for family holiday tech support. Maintain a list of pertinent information regarding your family’s devices. You can create a simple text document, enter the information in a spreadsheet, or use a notebook dedicated for this purpose. Information about the devices should include make, model and year of release. For example, if dad owns an iPhone 5, you will know where to look for troubleshooting tips, help with updates, etc. You should also include details about any services they’re using such as iCloud, Office 365, Dropbox and so on. You should also be aware of their backup systems. This makes it easy to retrieve something if you need to do a restoration. When you assist your family members, you will most likely need them to enter their passwords to authorize software installations or on certain websites. 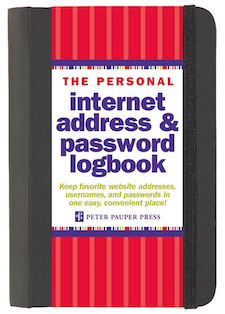 You should encourage people to keep track of their own passwords and ensure they have access to the passwords during their “tech support visit.” To help my parents, I gave them a notebook designed for recording their passwords. It is easy to use and lets us avoid the frustrating experience of trying to remember usernames and passwords before we can start to solve a problem. A notebook and a pen. Sure, we troubleshooting tech gadgets but you can’t beat a notebook and a pen for jotting things down. I use it as my short-term memory when I need to quickly store a password, setting or URL. An internet-connected device of my own. When I come across a problem that I can’t solve on my own. I rely on an internet search for answers. With these tools in place, I’m ready to tackle almost any problem. It’s satisfying and I’m happy to do it. With the list of questions complete, I move on to my own to-check list, which follows. One thing I always do is make sure their devices are running the most recent version of the appropriate operating system. I’ll also check to make sure that apps and software are up-to-date or at least running the most appropriate version for their device. For example, an iPhone 4 probably shouldn’t run the latest version of iOS. This is why creating a list of hardware make, model, and year is so important. Many devices “max out” at a certain version of an operating system and function best with that version. It is crucial is to ensure that the software, apps, and documents on their devices are being backed up regularly and successfully. I recommend a “set-it-and-forget-it” system such as Backblaze. For just a few dollars per month, you get everything on your computer backed up without having to lift a finger. If you need to retrieve something, it’s there. I also recommend people keep certain documents in a Cloud storage service such as a Dropbox folder or Google Docs. Photos can be stored via Apple’s iCloud or Google Photos. iPhones and many Android phones have built-in backup solutions that, once set up, do their job without any prompting. It’s easy to bemoan the responsibility of family tech-support manager, but taking the time to prepare and organize information ahead of time will remove much if not all of the headache. And remember, when you finally resolve that one annoying problem, you’re the hero of the holiday! Good day, Unclutterers. We hope all of you who celebrate Christmas had a good one. Now is the time to enjoy the time off from work, the company of friends and family, and the leftovers from last night’s dinner. Additionally, December 26 is the perfect time for a little post-holiday organization. Nothing too taxing, we want you to enjoy your holiday. With that in mind, here are five simple, effective things you can do today to stay on top of things. Prepare for ornament storage. It’s common to feel sentimental about the things we own. Holiday ornaments often fall into that category. Protect the decorations that mean something to you with safe, secure storage. A specialized bin like this one will do the job, but really you can make one nearly as effective with a plastic bin and some styrofoam cups. In either case, prepare your solution now so that it will be ready when you’re putting the decorations away. Organize a wrapping station. A gift-wrapping station will serve you well through the years. Perhaps you struggled a bit this season. If so, take an hour or so to sort that out . A hanging gift wrap organizer keeps things tidy and accessible. Take a quick inventory of the supplies you currently have. If required, take advantage of post-Christmas sales and pick up any supplies you may need. Figure out how you’ll store those lights. The coat hanger trick is a good one, as are storage reels. A piece of cardboard works perfectly for me. 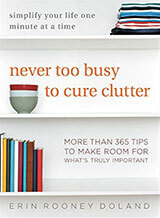 Unclutter unwanted items. 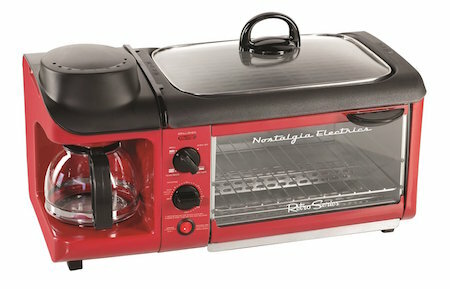 For many, an influx of new toys will raise the question of what to do with the old ones. Here are many options, from donation to re-use. Make thank-you cards. If there are kids in the house, use scraps of colorful wrapping paper to make thank-you cards. Find pieces you like, cut into festive shapes and affix to plain thank-you cards. Grandma, grandpa, aunties, uncles, etc. will love to receive these. When you put the decorations away should be based on your schedule or perhaps family tradition. Some do it right away while others may wait until January 6, the Christian celebration of Epiphany. In either case, a little preparation will make that process easier. What does one do with old, vintage sentimental bed spreads? If the bedspreads have sentimental value but you no longer wish to keep them, consider asking family members or friends if they would like them. Send an email or letter describing the history of the bedspreads and include a few photos. If the bedspreads are in good condition, a museum or local historical society may be interested, especially if the quilts handmade by local artisans or citizens of local importance. It always helps if you can provide historical context around the item being donated such as the life of the artisan(s) and the creation of the quilt itself. Occasionally theatre or reenactment groups may need quilts made during a specific time period. They may be willing to accept your donation. Storing and displaying vintage quilts and bedspreads can be laborious. Antique fabric in general is difficult to handle because it is easily damaged. If you do not have the confidence or ability to manage a project like this, consult a local museum or historical society. They may be able to refer you to someone in your area who can take on your project. The Great Lakes Quilt Centre provides quite a bit of information on how to clean, store and display antique quilts. Washing can enlarge holes and bunch up batting. Wringing and pulling can break seams and damage fibres, especially when they are wet so do not put quilts in a washing machine or hang them on a clothesline. Dry cleaning should also be avoided. A gentle vacuuming with low suction through a fiberglass screen is recommended to remove dust. In storage, quilts should be folded as few times as possible. Every few months, refold them along different lines to avoid permanent creases. Stuffing the folds with acid-free paper or unbleached muslin can help avoid fold lines. Wood, cardboard and plastic can emit chemicals that cause fabric to break down. Store quilts in unbleached, 100% cotton pillowcases or sheets to protect them from light and dust. Acid-free storage boxes are ideal for storing these types of textiles. Quilts can also be rolled onto acid-free tubes and covered with a cotton or muslin sheath to protect them from dust. Store quilts in an area that is not subject to fluctuations in temperature and humidity. Ideal conditions are slightly cooler than room temperature and around 50% relative humidity. Avoid light (sunlight and artificial light) because it can damage fibres as well as cause fading. To capture historic details of the quilt, iron a piece of muslin to a piece of freezer paper and use a typewriter or laser printer to print the historical information about the quilt. Peel the fabric label from the paper and hand stitch the fabric carefully onto the back of the quilt. You could also use indelible ink to write the information on the muslin by hand and stitch it onto the quilt. It can be helpful to create a muslin pocket to hold other important information such as photos of those who made the quilt or a family tree diagram showing the relationship between the quilt maker and the quilt owner. Finally, if you still have a sentimental attachment to your quilts and bedspreads but do not feel that it is worth the efforts to properly store them, consider taking photos of the entire quilt and close-up shots of specific fabrics. Write the story of the quilt-maker, how the quilt was made and how it came into your possession. “Publish” the story on your own and share it with your family and friends. Donate the quilt itself to charity or to an animal shelter. Bananas are a quick and healthy snack. My husband, a cyclist, often takes a banana (or two) on long distance bicycle rides. Bananas are fast and easy to eat on the go. There are many ways to transport a banana. You can put a banana in one of the three pockets on the back of your cycling shirt. You can also put a banana in your backpack along with all of the other items you carry. I’ve even known cyclists to put a banana into a water bottle so that it fits in the water bottle holder already attached to the bicycle. 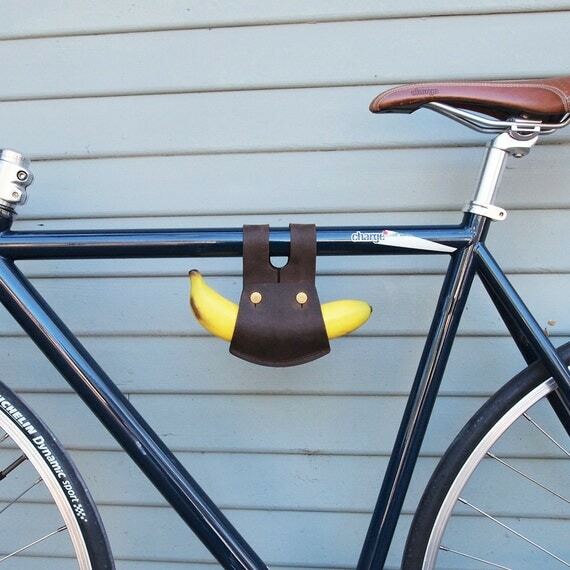 Now there is a new way to carry a banana on a bicycle – the Banana Holder. Made from genuine leather, this holder can fasten a banana to your bicycle in three different ways, under your cross-bar, to your handle bars, or under your seat. For only $55 USD, you too can carry a banana, and only a banana, on your bicycle for all to see. Thanks to Unclutterer reader Llynn for bringing this expensive unitasker to our attention. Many people love to receive tech-related gifts during the holidays. Phones, computers and tablets are sure to make the gadget-friendly name on your shopping list very happy, myself included. The neat thing is that in 2016, software is a valid gift option for techies and unclutterers alike. Here’s how to gift apps and software this holiday season. Apple’s App Store has been providing software to iPad and iPhone owners since July, 2008. Since then, it has delivered apps to customers more than 130 billion times. That’s a lot of software on a lot of devices. If you’d like to give that perfect app as a gift, it’s easy to do. You’ve got two choices. The easiest is to simply buy a gift card that is redeemed by the recipient. You can send buy a physical card like the one linked above from Amazon or from your local grocery store. The other method is to buy a digital gift card. It’s a little more involved, but still not difficult. Here’s what to do. Open the App Store either on your iOS device or Mac. Enter your lucky recipient’s email address. By default, your gift is delivered immediately. However, you can opt to have it show up on a certain date. To make that happen, tap Today and then select your custom delivery date. Enter the recipient’s email address and if you’d like, a custom message. Again, the app will be delivered by default. You can change that by tapping Today, and then selecting your own date. Let’s say the techie on your list uses an Android device. You can easily buy a Google Play gift card just about anywhere (grocery stores, shopping malls, etc.). You can also buy a digital gift card by following these simple steps. First, visit the Google Play Store in any web browser, select the amount you’d like to gift, enter the details and off it goes. Unfortunately, as of this writing, you cannot gift individual apps from the Google Play store. It’s a bit disappointing but the recipient can use the gift cards to buy his/her favorite apps. Some would argue that a gift card isn’t the most personal gift in the world, but because it lets someone choose precisely what he/she loves, gift cards are fine with me. Happy digital shopping. Every year I get a few comments from Unclutterers about the wastefulness of wrapping paper. It’s there for a few minutes and then it’s gone and tossed into the trash. Now, I understand that wrapping paper adds to the festive feeling of gift-giving. A carefully-wrapped gift can express caring and affection for the recipient. I love a well-wrapped gift, but I can see the other side, too. If you’re in the anti-wrap camp, here are several ideas for clever ways to wrap gifts without paper. A beautiful cloth can make a gift look fantastic. Furoshiki is a type of traditional Japanese wrapping cloth that’s perfect for oddly-shaped packages or gifts. It’s also a great choice when a scarf or beautiful cloth is part of the gift. If you want to give this a try, download this beautifully illustrated PDF from Japan’s Ministry of the Environment. Likewise, the video below provides a nice step-by-step for a popular method. You can also re-purpose decorative napkins, old curtains or scrap fabric. Simply stitch them together for a fun, vintage look. Lastly, I found this great idea using a cable knit sweater , some ribbon and decorative pine cones. It’s clever and looks great. For many, the issue is the single-use nature of wrapping paper. One thing you can do about it is re-use decorative retail bags. Here’s a great example using holiday-themed grocery bags from Trader Joe’s . Likewise, you can buy an inexpensive stamp like this and some scrap paper from the printer, junk mail, etc. and create great-looking wrap. When I was young, my mother would occasionally wrap presents in the color Sunday comics from the newspaper. It always looked great and I thought it was a lot of fun. You can buy a gift bag. It’s not my favorite solution, but it’s there. If that’s not your thing, consider these other fun packages and gift wrap. Here’s a great tutorial on turning a cereal box into a lovely and charming gift box. Likewise, here’s a tutorial on using a Pringles container to present beautiful, customized gifts. I hope this list was helpful. A thoughtfully-wrapped gift can say as much as the goodie it contains. And yes, paper is not your only option. Have fun wrapping! And don’t worry, there’s plenty of time left. 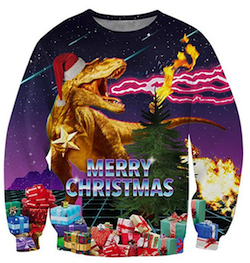 This Friday is National Ugly Christmas Sweater Day. There is nothing more unitaskery than an article of clothing that you wear only once a year – except, of course, an ugly article of clothing that you wear only once a year. Costumes of all types tend to be unitaskers but I’m really not a Scrooge. I understand the fun and whimsy that is needed during the dreary winter month of December. I also appreciate that many Ugly Christmas Sweater events support charities. If you’re planning on participating in Ugly Christmas Sweater Day, try shopping at used/consignment clothing stores before purchasing something new. You could also host an ugly sweater swap party where friends can exchange their sweaters so everyone has something new to wear the following year.